With the holidays just around the corner (they’re coming whether you’re ready or not, you know), it’s time. Time for the annual Paperwhite Bulb Forcing Frenzy! Yes, Christmas will be here in a few short weeks. Eeek! 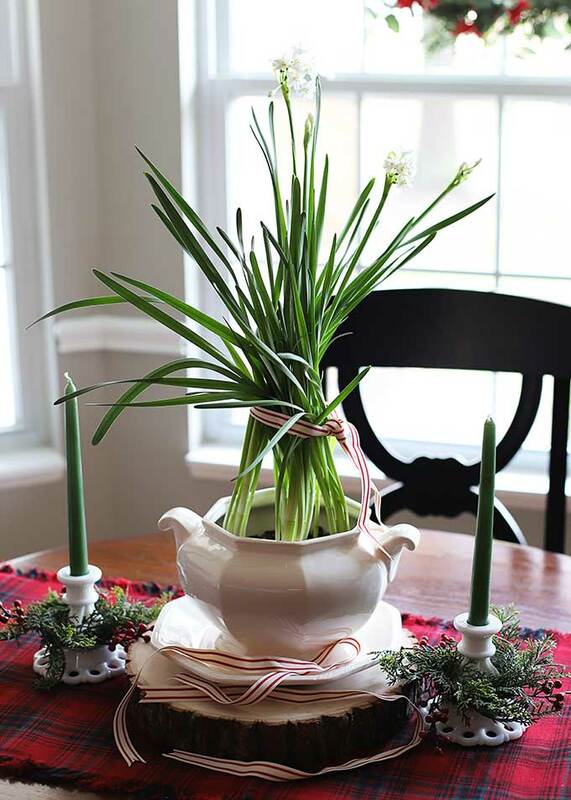 I love how Paperwhites give a nice pop of snowy white color to the holiday decor. We can’t be all ho ho ho and Shiny Brites dangling from the chandelier all the time. 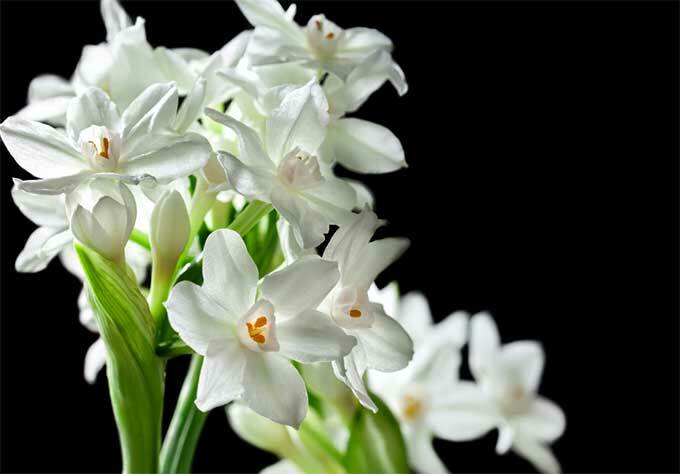 Plus, Paperwhite Narcissus are so easy to grow! They do not need to be chilled like other bulbs, so no need for that added step. If you do not know what I mean by “chilled”, just disregard it, because you don’t have to do it! Pick out a container to place them in (see below). Put a small layer of stones on the bottom of your container 1-2″ deep. I use either aquarium gravel or a bag of stones from the dollar store. Put a few more stones around the bulbs for support. 1/2 to 3/4 of the bulb should be showing above the stones. Add water until the water is just below the bottom of the bulbs. The bulbs don’t like to sit in the water themselves, much like your great-aunt Martha. Put the container in a well lit area and keep it watered, just not too much. Please refer to Aunt Martha above. 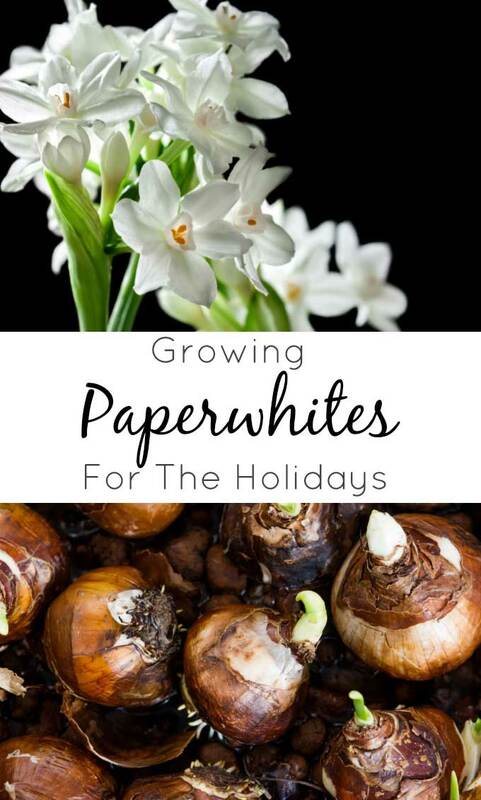 In 4-6 weeks you should have a super spectacular white flower show just in time for the holidays. Now that you have the HOW down, there’s the WHERE question to be answered. There are just so many great places to plant these guys!!! 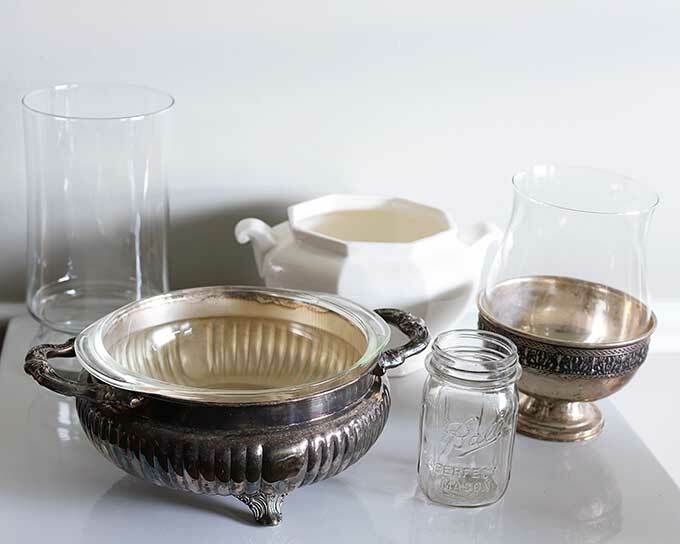 Silverplated casserole dishes (you can find these at the thrift stores ALL THE TIME). Tall or shallow? That is the question. It really is a personal preference, a shallow planter bursting with paperwhites is a beautiful thing. But keep in mind any shallow dish may require staking eventually or they might topple over. Taller vessels will use the sides to hold them together, but make sure your tall vessel is glass so the light can get through to the growing bulbs. You wouldn’t want to use a tall stoneware vase for example. Last year I chose to plant them in some quilted jelly jars. 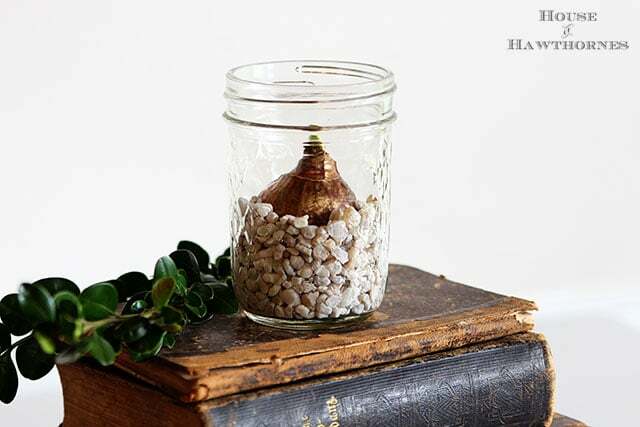 They’re just the perfect size for one bulb and would make fantastic teacher or hostess gifts (picture some bakers twine wrapped around the top with instructions on how to take care of them tied to it). 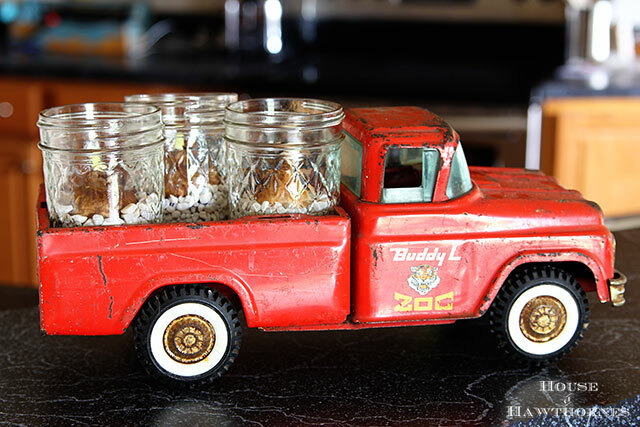 I think the small glass jars are perfect to just place around the house. 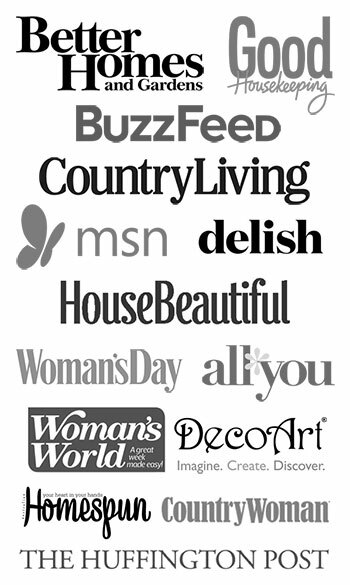 They can be grouped any which way you want without being super permanent. AND they like to ride around in the back of toy trucks. And whenever I can work my red toy truck into a vignette, it’s a good day! Fast forward a few weeks – this is what they looked like when they bloomed closer to Christmas. 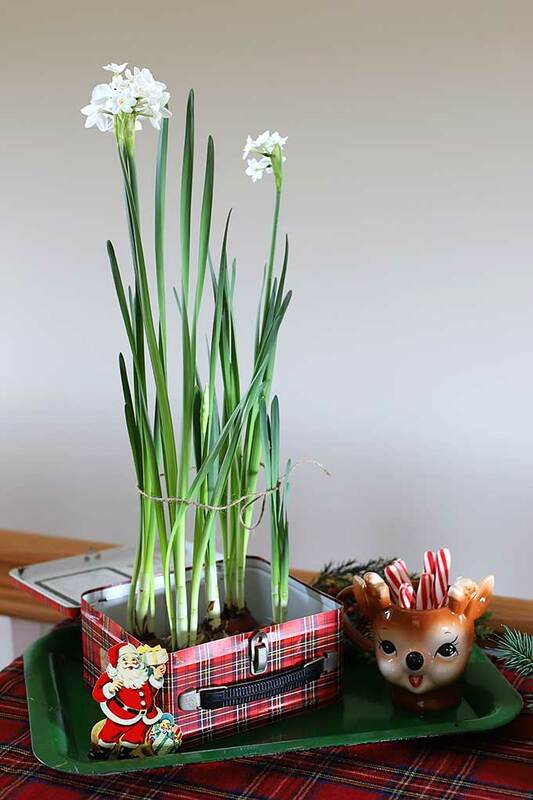 The best time to plant your paperwhites for Christmas blooms would be 4-6 weeks before you want them at their best. If you want them blooming in early December for the start of Christmas party season, plant in mid to late October. If you want them blooming closer to the actual Christmas day, then plant them anywhere from November 1st through November 15th. November 25th at the absolute latest. 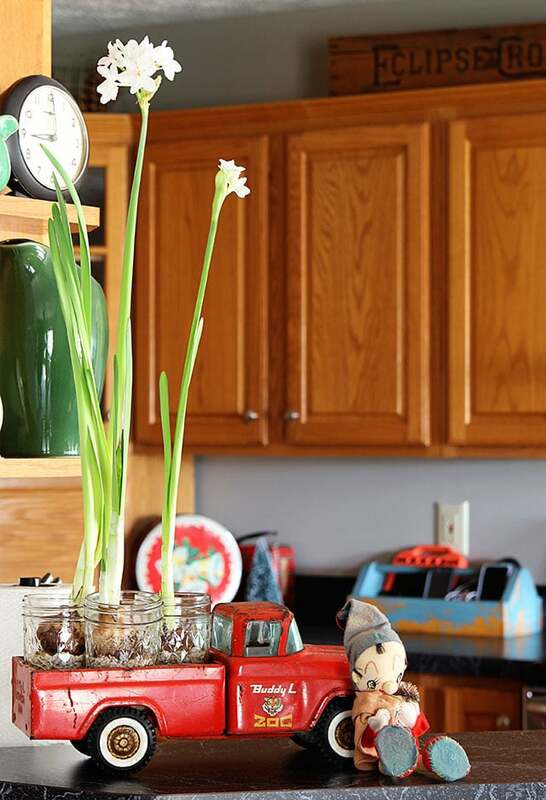 I actually like to start different sets of them every two weeks from late October through late December, so I always have some fresh paperwhite blooms throughout the gloomy days of winter. That’s simple. Throw them away! Seriously though, they rarely bloom again indoors and if they do it’s after a couple years of intense babying. It takes a lot of the bulb’s energy to go through a “forcing” situation in the first place, so they just don’t have the stored energy reserves to do it again very soon. This article from Gardening Know How goes into it in a little more depth, but as much as I hate to say it, it’s best to just throw them away and buy new bulbs next year. If you prefer to pick them out in person, they are carried by most local nurseries along with the big box stores. I’ve even seen them in the grocery stores already planted and starting to bloom (but what’s the fun in that)! Previous Post: « It’s Time – Mrs Meyers Holiday Scents Are Here!!! 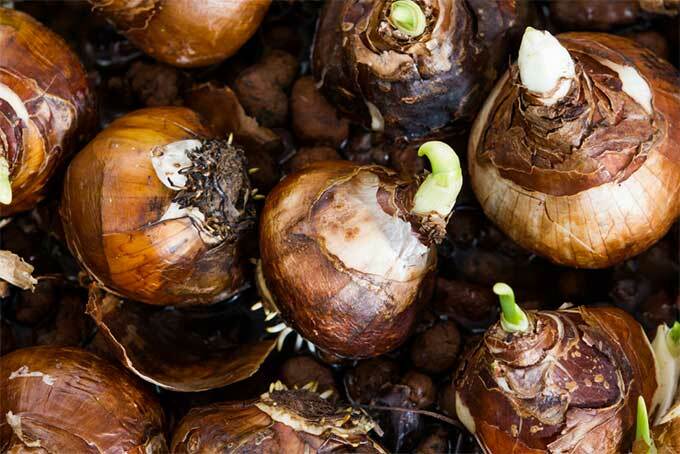 The idea of growing these bulbs in soup tureen or a silver casserole dish is brilliant! 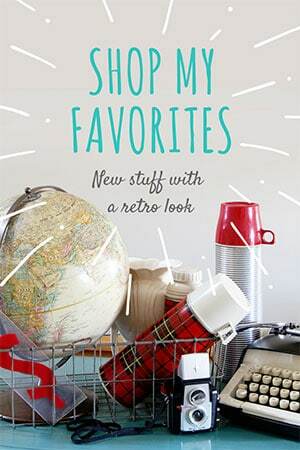 I’ll definitely be searching my thrift store for some of those now! I need to get some started! 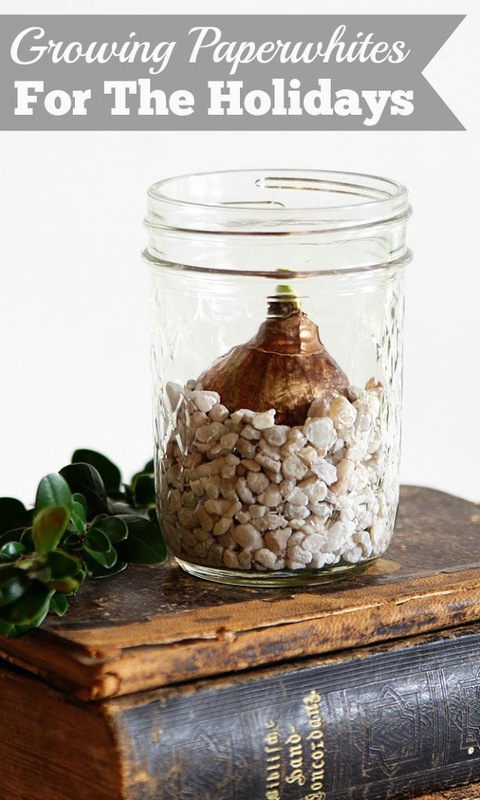 Love all of your container ideas…especially the simple jar and rocks!